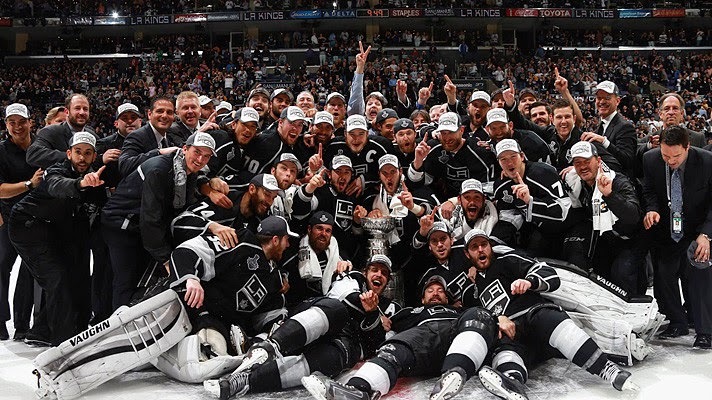 For the third year in a row and the fourth time in five years, the Western Conference won the Stanley Cup as the Los Angeles Kings took out the New York Rangers in five back in June. With the 2014-15 NHL season kicking off this week, can the Kings repeat? Will their nemesis in Chicago find their revenge and get back to the Cup Finals? Or will the somebody from the Eastern Conference win Lord Stanley's Cup? Here are my predictions. The Bruins should be primed for a deep run in the Eastern Conference, and they will be motivated following a disappointing exit in the second round to Montreal. They are loaded once again, even after they lost Jerome Iginla in the offseason, with a strong offense, a stacked defense and great play in net with Tuukka Rask. Who knows what this team can do with a full season of Steven Stamkos, who is only one of the elite snipers in the game. The offense will be even better in that case and that couples with an improving defense and Ben Bishop, who broke out last season before getting hurt late, in net. The special teams are not great and this is still a young club, but they should be a legitimate contender in the Eastern Conference this spring. The Habs surprised many by making the Eastern Conference Finals and who knows what they could have done had Carey Price not gotten injured in Game 1. Price will be the strength of the club as will the blue line units, led by P.K. Subban, but this is a team that may struggle to find the back of the net. They didn't really do much to address the offensive units so that will make it tough to get so deep in the playoffs again. The Red Wings are aging and return virtually everyone from last year's team but they do still have hope with a good supply of talented prospects. Those talented kids, including Gustav Nyquist, Riley Sheahan and Tomas Tatar, will help the Wings barely keep their playoff streak alive. That said, as Pavel Datsyuk, Henrik Zetterberg and Niklas Kronwall, among others, aren't getting any younger and that means a deep playoff run is off the table. The Leafs should be better than they were a season ago but even then, I'm not sold they have enough to get back to the playoffs. The offense, led by Phil Kessel and James van Riemsdyk, should be strong but the defense still looks weak and while goaltenders Jonathan Bernie and James Reimer are solid players, they didn't look that great a season ago. The post-Jason Spezza era begins now for the Senators and it is going to be tough for them to replace his offensive production, and especially with the Bobby Ryan contract issues not going away anytime soon. The defense should be be the strength of the club as Erik Karlsson is elite on the blue line but after Craig Anderson took a nice step backward a year ago, how much time will Robin Lehner get in net? With Roberto Luongo back in Sunrise, and happy once again, the Panthers shouldn't have any issues in net. There is also some talented youth on the roster, including a quartet of top-three draft picks. The defense still has to improve in front of Luongo and the offense needs some of the youngsters to take steps forward, and GM Dale Tallon is on the hot seat. That said, this Panthers club could be interesting. It is going to be a long season for fans in Western New York as the Sabres are in the midst of a rebuilding process, leaving this to be a lost season more or less. This club really lacks many strengths, particularly with a gaping hole in goal, but this season will be important to get guys like top draft pick Sam Reinhart. The Penguins have a new brass running the show with new GM Jim Rutherford and new coach Mike Johnston and they'll get to enjoy two of the game's best in Sidney Crosby and Evgeni Malkin. They did lose James Neal but Patric Hornqvist should help fill his void. Marc-Andre Fluery gives you a little bit of everything, with the good and the ball, in net. They do lack the depth that other teams have but even then, they should be Cup contenders in the East. The Ryan Johansen contract dispute has finally come to an end on Monday and with that, the team can resume the momentum they were having with a nice summer led by the trade for Scott Hartnell from Philadelphia. The offense projects to be pretty good while Segrei Paplinsky Bobrovsky was sensational last year but can he keep it up with a less-than-stellar defense ahead of him? The Blueshirts surprised many en route to the Stanley Cup Finals but it will be tough for them to repeat it. Henrik Lundqvist is still an elite goaltender but he didn't play like one for much of the regular season last year, but the defensive unit is still strong. Chris Krieder made some big plays in the postseason but can he put it all together along with Rick Nash to improve the New York offense? Will we see the Flyers that got off to a dreadful start last year, or the one that finished the season strong in making the playoffs. Philadelphia is still very good up front even after trading Scotty Hartnell to Columbus, and Claude Giroux is a big reason why. He's the Flyers' star but he is far from the sole piece as the offense as a hole is good. The defense still looks like a mess and while Steve Mason had a nice 2013-14, he still isn't proven. That said, they should get back to the playoffs. The Marty Brodeur was awkward for both parties but it was clear that the Devils had to move forward with Cory Schneider in net as he is much better than Brodeur at this point. He will enjoy one of the league's better defensive units, as led by captain Bryce Salvador. The key for the Devils, again, will be offense as they struggled to score. Jaromir Jagj still has been playing well, but he isn't a spring chicken, meaning the acquisitions of Mike Cammalleri and Martin Havlat have to produce right away. Barry Trotz will bring a new attitude and coaching style to the Caps but it's going to be tough to get the Caps back to the playoffs. Alex Ovechkin is indeed a star but he's also a flawed star with his inconsistent defensive efforts, so it will be interesting to see how he meshes with Trotz. The power play should be strong as always and Braden Holtby is decent in net when he gets help from his defense, but Trotz will not fix all of Washington's flaws this first year. John Tavares is a star and should be healthy over a full season for the Icelanders, he will be a big difference for the team but the team does not have much depth behind him. But New York should be much better in net with after signing Jaroslav Halak, who was very good last year for St. Louis. It isn't that crazy for New York to sneak into the playoffs but they will surely stay out of the cellar. For the good folks down in the Research Triangle, this will be a long season. The leg injury to Jordan Staal will put him out for a good chunk of the season but at least the team still has some decent offensive talent with Eric Staal and Alexander Semin. However, the team is pretty shallow depth-wise and a rebuilding process should commence sooner rather than later. The Hawks were close to getting back to the Cup Finals in their quest for a repeat but they will definitely be in the mix to win it all once again. A deep and talented roster, led by Patrick Kane and Jonathan Toews, got a needed upgrade, they hope, with Brad Richards filling the role of second-line center. The defense is deep and Corey Crawford can get it done in net. Can this be the year the Blues finally do something of note in the Stanley Cup Playoffs? Time will tell but their defense should be tremendous once again in front of Brian Elliott in net, who will replace the departed Ryan Miller. Ryan Statsny should help build further depth in their front lines and further improve their forward. The Wild were able to take out the Avalanche in the playoffs despite a less than stellar offense. Now with the arrival of Thomas Vanek, who gives them a much-needed sniper, the offense should help the team take a step forward. There is some young talent on this club and veteran leaders Zach Parise and Ryan Suter return, but there are some questions in net that have to be addressed with Josh Harding hurt. Patrick Roy led a surprising Avalanche playoff berth amid a strong regular season in his first season as the coach in Denver, but one ending in disappointment in the first round of the playoffs. Nathan MacKinnon is a star in the making, the rest of the offensive front is strong and the veteran acquisitions of Jerome Iginla and Daniel Briere should help the cause. However, the defense is still a big question mark, putting pressure on goalie Semyon Varlamov. The offense was very good for Dallas last year and now with Tyler Seguin and Jamie Benn now being joined by Jason Spezza, it should only get even better. And it will have to be better to counter for a blue line unit that is a little bit of a question mark and is not particularly deep. Kari Lehtonen is talented and capable of both sensational saves and questionable decisions but he was solid for coach Lindy Ruff last year. Peter Laviolette will bring much difference in terms of philosophy than did predecessor Barry Trotz as he will look to open up the offense, but there isn't a great amount of offensive pop aside from free agent signee James Neal. Shea Weber will lead a strong defense along with the rising Seth Jones and Pekka Rinne is in goal. The Preds are in a tough division but offensive improvement could find them in the playoff mix. Winnpeg really did not do that much this offseason, which will likely relegate them to the cellar. The big concerns for the Jets are in net, where Ondrej Pavelic is unproven, and in front of him defensively. At least this club has some youth and some talent so the hopes for some progress are far from far-fetched. There has not been a repeat Cup victor since the Red Wings in 1998 but this Kings club is loaded for another deep run this spring. The roster just about returns in full and their stars Anze Kopitar, Drew Doughty, Jonathan Quick and a strong supporting cast will prove tough to beat in the playoffs. Can they escape the dreaded Cup hangover? The deep Anaheim offense got deeper and better with the acquisition of Ryan Kesler from Vancouver as he will give them the kind of second-line center they have craved. With Corey Perry and Ryan Getzlaf back, there shouldn't be any issues scoring points for this team while the defense is solid and the goaltenders are talented. Ah yes, who can forget how the Sharks were on the verge of sweeping the Kings in the first round of the playoffs, only to fall apart (again). The core returns in tact, meaning a strong offense and a couple of sound defensive lines, but it also is a little older. In other words, same old same old in Silicon Valley. The Canucks are surely happy to get away from the John Tortorella disaster but even then, I don't love them as a playoff team, particularly without Ryan Kesler. Now the offense will have to rely on the Sedin twins as well as free agent signee Radim Vrbata. They also traded away Roberto Luongo late in the season and replaced him with Ryan Miller, who was disappointing in St. Louis last year. Similar story once again for the Coyotes as they are no longer representing Phoenix but the state at large: solid defense, good goaltending, strong coaching and mediocre offense. Without Radim Vrbata and Mike Ribeiro, the Arizona offense is really going to struggle, leaving much pressure on goalie Mike Smith. The rebuilding process seems like it has been going on forever for the Oilers and it will continue this season. There certainly is a lot of youthful talent on this club but it has yet to break out. One of the key guys is the talented Nail Yakupov, who is still an enigma to many. Should he, as well as Taylor Hall and Ryan Nugent-Hopkins, take a step forward, Edmonton could use some real improvement. However, the playoffs are a stretch. The Flames are finally going through a rebuilding process of their own and it looks like one that will find them in the cellar. Jonas Hiller should help out the cause in net but the defense in front of him is far from imposing and the offense lacks punch. As least the future looks bright for the first time in a couple of years with some talent on the way. The kids are all right for the Red Wings and the veteran presence still remains but this club just does not have the horses anymore, particularly to take out the Bruins. The offensive prowess of the Lightning goes up against the defensive game of the Habs. Montreal will struggle to score but with Carey Price in net and P.K. Subban leading the blue line units, I think they can keep Steven Stamkos in check just enough to advance. Who doesn't love when Pittsburgh and Philly go at it? You know the Flyers will get physical with the Penguins but they just don't have the defensive corps nor the consistency in net to hold off the Pens' stars. The physical experience of the Rangers against the youthful talent of the Jackets could make for a compelling matchup. That said, I do think Henrik Lundqvist can slow down the Columbus attack and their chippiness will propel them forward. The firepower of the Stars offense will keep them in any game and may even help them steal a game from Chicago. However, they just don't have the depth to consistently hang with the Blackhawks on both sides of the ice. The Wild may have more starpower than the Blues do, with the exception of T.J. Oshie, but they lack the depth that St. Louis has and they have more instability in the net. Minnesota will make it interesting but the Blues will survive and advance. I think that Colorado is poised to take a step backward than from a year ago, but I do still think they will be a playoff club. That said, they are going to need Semyon Varlamov to stand on his head quite often if they want a chance in this series. LA will cruise. San Jose has the well-deserved reputation of not being about to get it done in the playoffs but at least this time, nobody will consider them chokers like they have in the past. The Ducks will get an easy series to advance. Montreal's strong defense and goaltending play can help them get past the Lightning but it will take a lot to get pass a more balanced Boston squad. They just don't have the offense to get by Boston's defense and Tuukka Rask. When these two faced off in the Conference Semifinals a year ago, the Penguins raced out to a 3-1 series lead before the Rangers pulled off an epic comeback to win the series. Considering both have their share of flaws, this should be a fun one again but I think Pittsburgh will get it done this time. The folks always come out for the Chicago-St. Louis rivalry and this should be a good one like last year's matchup was in the first round. That said, I do find the Blackhawks to be the superior club and while I like Blues goalie Brian Elliott, I have more confidence in Corey Crawford. The Freeway Series comes to the playoffs once again as it did a year ago with Los Angeles winning a wild series in seven games, and I think we will see a similar result here. Anaheim has the players to match up with the Kings, but the Kings know how to get it done come playoff time. That's lazy analysis, but hey. Can you rely on Marc-Andre Fluery when it counts the most? We have been asking that question for several years now and I still don't believe we have an answer. Pittsburgh does have the stars, but Boston is deeper and stronger on the blue line and in the net. They'll advance to the Cup Finals. Not a particularly inspiring prediction for the WCF but let's face it: these are still the best two teams in the Western Conference. They have showed down before and they will do it again. And this time I think the Hawks are due. Again, not a particularly inspiring Finals predictions but hey, I went off the wall last year and got royally burned. I do have the Blackhawks in my Finals prediction for the second year in a row and while the Bruins are due to win another one these, I think Chicago will reign supreme once again. Can't wait to see the Arizona Canucks and Vancouver Coyotes.